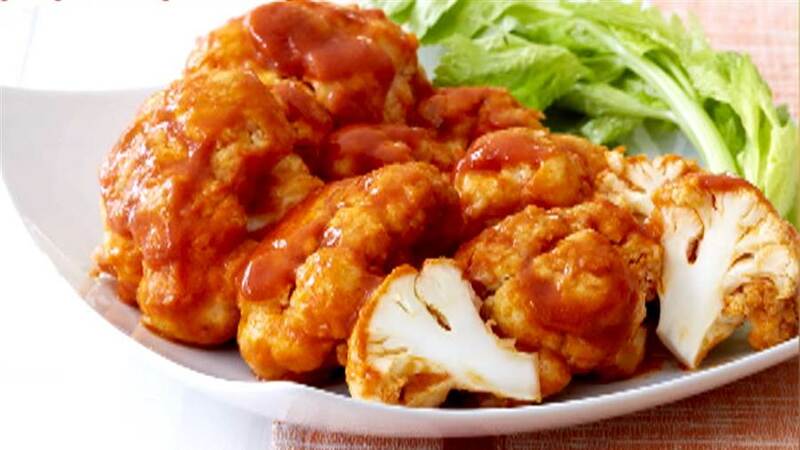 This is one of the most delicious ways to get your fix for buffalo wings that is also extremely healthy and oil-free. This recipe creates a wonderful skin around each wing. It is so easy for two people to eat an entire head of cauliflower that I recommend at least doubling this recipe. Using orange cauliflower makes for an even more interesting and healthy presentation. Also included is my dill sour cream dipping sauce. ¼ cup Hot sauce of your choice. When choosing your cauliflower, pick the ones that have the largest most abundant stem leaves. They are very delicious and make a wonderful addition to celery stalks when serving. Just slice the thick leaves into ½” wide strips. Place the cauliflower on a cutting board with the stem facing up. Using a thin knife, carefully cut about 3” deep around the core then spread the cauliflower open like a flower, removing the core. Now separate the florets into medium sized pieces. I like to slice the florets in half down the middle to create a flat side to bake them on. Combine the rest of the ingredients in a medium to large sized bowl. This batter recipe will make enough for 1 large head of cauliflower. Now mix in your favorite hot sauce. Add as much or as little as you like. Combine all the ingredients except the dill, in a food processor and blend until creamy and smooth. After blending, transfer the dill sauce to a jar or bowl and mix in the dill.